Shop Remo Artbeat Tambourine 10 Inch 10x1 Row Candy Skull by Jose Pasillas from AMS with 0% Interest Payment Plans and Free Shipping. 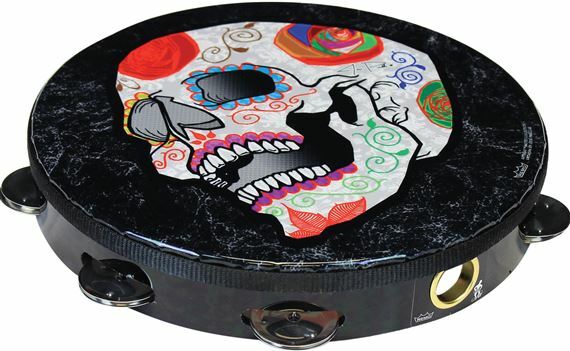 With Candy Skull artwork by Jose Pasillas, the Artbeat Artist Collection tambourine features a bright open jingle tone and a graphic processing that infuses the image on the Mylar drumhead. Featuring original artwork by Jose Pasillas of the band Incubus, the Artbeat Artist Collection tambourine is constructed with an Acousticon shell and a pre-tuned graphic drumhead with a single-row 8 jingle set. The ARTBEAT ARTIST COLLECTION Tambourine is lightweight, durable and maintains a professional quality tone for all drumming applications.